Halloween (2018) carries with it the legacy of John Carpenter’s original horror-slasher of the same name and with the night of horror fast approaching, why not compare and contrast the two films in a way that can determine if the sequel holds up. The original Halloween follows the child-monster that is Michael Myers from his beginnings to his first escape of the asylum to terrorize the town of Haddonfield, Illinois. The original does begin the concept of the following stranger being around the corner at any moment. The dialogue doesn’t hold up where it should and a lot of it is very dated, even at the time. Though the initial sense of a so-called nobody going around and killing with absolutely no purpose does hold a special place in the film’s scenes. The idea of someone just hanging out behind the clothes on the clothes rack does seem to be more scary with the directing of certain shots. Of course, nothing beats a tense scene being accompanied by John Carpenter’s original score blasting in the background while the audience guesses how the kill will be delivered. The weaknesses do come in the initial dialogue, where it either doesn’t actually make any sense and in other places it’s just laughable. The character of Laurie Strode played by Jamie Lee Curtis gives such a campy 1970’s stereotype woman that it is interesting in a historical sense to see how different it was only 40 years ago for such different ideas to be placed in these characters. 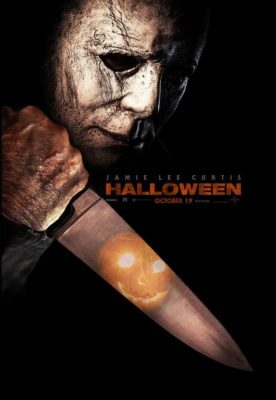 Halloween (2018) more or less follows the evolution Curtis undergoes, when after 40 years of captivity, since the ending of the 1978 version, she has gone from fearing Michael Myers to hoping for his escape to fight and hopefully destroy him once and for all. This film is directed by David Gordon Green and one of the best things about this film is the number of similar shots copied over from the original and shown in a new creative way. The film does seem to follow its predecessor with the problematic script that it follows, where there are some dialogue choices that don’t feel natural in the slightest and aren’t delivered well to boot. The strengths come from how Laurie’s character transforms from a fragile young stereotype to a strong, independent badass who is determined to destroy the monster that essentially ruined her life 40 years earlier. As well as certain moments being fun to both cower away from and watch at the same time, Halloween 2018 gives its best in a market that believes that a horror movie should be done with minimal effort. If there was only one that could be watched this Halloween season, it would be the original not for the scarier experience or better characterization, but for its campy nature and clever shots that gave birth to the idea of a random stranger being the most dangerous thing out there. The new film does earn a watch on its own merits, yet the original itself stands high enough to be the better of the two in general.